Prime Minister Dr the Hon. Keith Mitchell has said that although the financial benefits of growing marijuana is current and trendy discussion, Grenada for now will go the way of growing the soursop fruit and not consider growing marijuana for medicinal purposes. “Grenada is not a marijuana growing territory like St Vincent and Jamaica… I prefer to plant a lot of soursop and other crops, in my view, that are much safer in every respect,” said Dr Mitchell, as he spoke about the economic contribution the agricultural sector is bringing to the country. Claiming that Grenada is not a major marijuana-growing territory, Dr Mitchell, who also serves at Minister for National Security, said that he wishes St Vincent and Jamaica the very best in focusing on that type of agricultural produce. “Soursop is much safer, so I will prefer to stay there,” he said, while pointing out that two scientists from MIT have told him that there is doubt with regard to soursop as a miracle drug, and every piece of the plant can be used for human consumption. “People have identified soursop as a miracle drug, No matter what complaint you have, they say to use soursop,” he said. The Marketing and National Importing Board has embarked on an initiative that is aimed at producing thousands of pounds of the fruit, because the island is one of the few in the region which can export soursop to the USA market. Research conducted by a number of well-known health institution has revealed that the nutrient content of soursop leaves and the fruit is believed to boost the immune system, and reduce infections of many ailments, such as diabetes, eczema, pain and acid reflux. In addition to the benefits mentioned above, soursop leaves are extremely effective in inhibiting the growth of bacteria, viruses, parasites, and tumor development. Its healing properties make it capable of being used as an anti-seizure medication. It is also capable of reducing fever, lowering high blood pressure, and help in treating inflammation and swollen feet. Soursop leaf consumption on a regular basis helps in improving stamina and facilitating quick recovery from diseases. 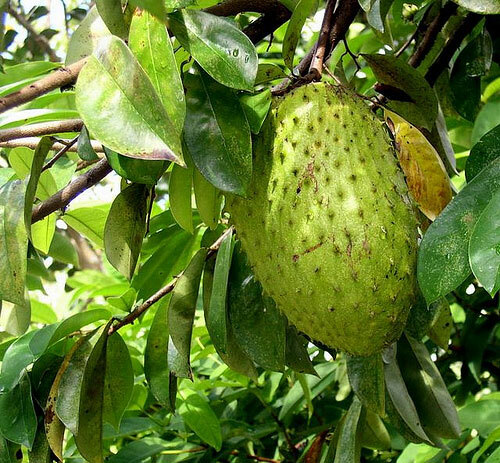 Data from the statistics department says that Grenada exported more than EC$1.6 million in soursop for 2014. The major markets are the USA, Canada, Trinidad and Tobago and the United Kingdom.